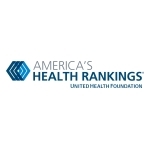 America’s Health Rankings Annual Report®. percent decrease in the last four years. decade, and achieved a 13 percent decline in the past year alone. in the report’s 27-year history. increased in the past year (from 250.8 to 251.7 deaths per 100,000). years, and increased by 4 percent in just the past year. – suggesting a troubling trend. increased by an astounding 157 percent. outcomes data to provide a holistic view of the health of the nation. children and of those who have served. For more information, visit www.americashealthrankings.org.